The OxyProbe 12 mm autoclavable dissolved oxygen sensor offers the most rugged and versatile design for benchtop bioreactor vessels. The compact profile saves space on a crowded headplate. It will fit directly into any 12 mm multipurpose port with standard compression fittings or Pg13.5 threads. 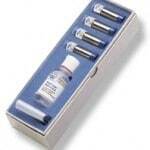 The small diameter facilitates DO measurement in small volumes, especially bottles and spinner flasks. 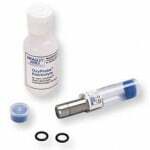 The OxyProbe 12 mm autoclavable Dissolved Oxygen sensor has the same rugged performance as the 19 mm and 25 mm sensors. This polarographic sensor utilizes the longer silver anode and small cathode which has become the industry standard. It also uses the same semi-permeable, Silicon/Teflon composite membrane, reinforced with stainless steel mesh. Part No. 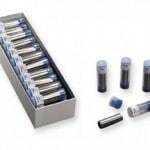 KC1225 25 membrane cartridges in one easy-to-store box. Internal o-rings, gaskets and electrolyte must be ordered separately.